March 22, 2010 – Scotlandville HS has a new Head Coach in Ken Hilton, who was Head Coach at Baker few years ago and was an assistant at Redemptorist HS this past year. I really enjoyed meeting with Coach Hilton. He’s a bright young Coach, who played at Baker once upon a time, and has paid his dues to be a Head Coach at a school loaded with Size and Speed. Ken Hilton will have Scotlandville winning, and I think it will be this year. Think of the players that have come out of Scotlandville in just the last 3 three years. Brandon Bolden – RB Ole Miss, future NFL player, Center Daverin Geralds – Ole Miss, who will go in the NFL draft this year, and current LB and OT from the Tennessee SEC program in Herman Lathers, and Dallas Thomas, both have NFL futures. You can also throw in Southern Illinois DB Korey Lindsey (6-0, 190), who will also go in the draft coming up in April. I met a Future possible NFL kid in SR Denzel Lewis, who is a tiny (6-5, 305) pounds, and has the maturity of a 30 year old. Denzel plays Offensive Line, and seems to really care about his future and looks like a great kid to coach. The kids wanted a group picture, which I thought was good, and you can tell in picture the senior class will be strong for 2010. Southern Lab HS has Head Coach Mike Roach, who played at Southern and was a heck of a player at Capitol high school back in the day. Mike was very nice as always to help me talk to 25 players from his team, and interview them for the season. One kid in particular seems to always have a big smile on his face is tiny OT Ezekiel Alsander, who stands 6-6, 285 pounds, I remember the first time I meet this kid at the school he was 6-5, 200 pounds and a True Freshman in high school. Ezekiel has a bright future at the school of his choice, and what’s crazy is that he’s still lean. LB Charles Butler (6-0, 235) I predict will have a monster season, and be dominate for Southern Lab. This is a Special group of seniors, and I predict great things for the team. Baker High School has some great football history. The 1970”S and 1980’s were just flat out dominant. This school use to have an enrollment of over 1,500 kids, but now it’s fewer than 500. I’m amazed how this school competes in athletics, with under half the enrollment they use to have. Baker high school did not have a Head Coach in place when I arrived, but no worries. I worked with the office and Teachers, who were very helpful in getting the kids out of class, to take pictures, and talk about Baker HS. Walking the halls, you think of ex players like Jerald Sowell – Tulane, Hokie Gajan – LSU, and the Saints, Trumaine Johnson – WR Grambling, played in the USFL, I can go on and on. This school still has the feel of kids that are close, and a small town that will give 100 percent of effort for 60 minutes in a game even if they have fewer than 35 players on the football team. I enjoyed talking to Derek Raby, who stands 6-1, 190 pounds and plays both sides of the ball as a WR, RB, and LB-SS. Derek is a kid who I think can play DI ball. He will play so much it will be hard to get a read on where to play him in college, but it doesn’t take a rocket scientist to see he’s a player if you watch him on the football field. He is mature beyond his years as well. Baker will be short on numbers, but I heard that they might end up with more than 40 players for spring practice which I think is very good for the school. Next I will talk about my trip to Redemptorist HS, Istrouma, and Glen Oaks. This is the first of a 3 part series for Baton Rouge. 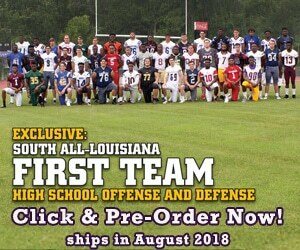 I will also have more Baton Rouge Schools featured, and my trip to Lake Charles as well this week.